This article is about the synthetic chemical element. For other uses, see Californium (disambiguation). Californium is a radioactive chemical element with symbol Cf and atomic number 98. The element was first synthesized in 1950 at the Lawrence Berkeley National Laboratory (then the University of California Radiation Laboratory), by bombarding curium with alpha particles (helium-4 ions). It is an actinide element, the sixth transuranium element to be synthesized, and has the second-highest atomic mass of all the elements that have been produced in amounts large enough to see with the unaided eye (after einsteinium). The element was named after the university and the state of California. Two crystalline forms exist for californium under normal pressure: one above and one below 900 °C (1,650 °F). A third form exists at high pressure. Californium slowly tarnishes in air at room temperature. Compounds of californium are dominated by the +3 oxidation state. The most stable of californium's twenty known isotopes is californium-251, which has a half-life of 898 years. This short half-life means the element is not found in significant quantities in the Earth's crust. [a] Californium-252, with a half-life of about 2.645 years, is the most common isotope used and is produced at the Oak Ridge National Laboratory in the United States and the Research Institute of Atomic Reactors in Russia. Californium is one of the few transuranium elements that have practical applications. Most of these applications exploit the property of certain isotopes of californium to emit neutrons. For example, californium can be used to help start up nuclear reactors, and it is employed as a source of neutrons when studying materials using neutron diffraction and neutron spectroscopy. Californium can also be used in nuclear synthesis of higher mass elements; oganesson (element 118) was synthesized by bombarding californium-249 atoms with calcium-48 ions. Users of californium must take into account radiological concerns and the element's ability to disrupt the formation of red blood cells by bioaccumulating in skeletal tissue. Californium is a silvery white actinide metal with a melting point of 900 ± 30 °C (1,650 ± 50 °F) and an estimated boiling point of 1,745 K (1,470 °C; 2,680 °F). The pure metal is malleable and is easily cut with a razor blade. Californium metal starts to vaporize above 300 °C (570 °F) when exposed to a vacuum. Below 51 K (−222 °C; −368 °F) californium metal is either ferromagnetic or ferrimagnetic (it acts like a magnet), between 48 and 66 K it is antiferromagnetic (an intermediate state), and above 160 K (−113 °C; −172 °F) it is paramagnetic (external magnetic fields can make it magnetic). It forms alloys with lanthanide metals but little is known about them. The bulk modulus of a material is a measure of its resistance to uniform pressure. Californium's bulk modulus is 7010500000000000000♠50±5 GPa, which is similar to trivalent lanthanide metals but smaller than more familiar metals, such as aluminium (70 GPa). Californium exhibits oxidation states of 4, 3, or 2. It typically forms eight or nine bonds to surrounding atoms or ions. Its chemical properties are predicted to be similar to other primarily 3+ valence actinide elements and the element dysprosium, which is the lanthanide above californium in the periodic table. The element slowly tarnishes in air at room temperature, with the rate increasing when moisture is added. Californium reacts when heated with hydrogen, nitrogen, or a chalcogen (oxygen family element); reactions with dry hydrogen and aqueous mineral acids are rapid. Californium is only water-soluble as the californium(III) cation. Attempts to reduce or oxidize the +3 ion in solution have failed. The element forms a water-soluble chloride, nitrate, perchlorate, and sulfate and is precipitated as a fluoride, oxalate, or hydroxide. Californium is the heaviest actinide to exhibit covalent properties, as is observed in the californium borate. Twenty radioisotopes of californium have been characterized, the most stable being californium-251 with a half-life of 898 years, californium-249 with a half-life of 351 years, californium-250 with a half-life of 13.08 years, and californium-252 with a half-life of 2.645 years. All the remaining isotopes have half-lives shorter than a year, and the majority of these have half-lives shorter than 20 minutes. The isotopes of californium range in mass number from 237 to 256. Californium-249 is formed from the beta decay of berkelium-249, and most other californium isotopes are made by subjecting berkelium to intense neutron radiation in a nuclear reactor. Although californium-251 has the longest half-life, its production yield is only 10% due to its tendency to collect neutrons (high neutron capture) and its tendency to interact with other particles (high neutron cross-section). Californium-252 is a very strong neutron emitter, which makes it extremely radioactive and harmful. Californium-252 undergoes alpha decay 96.9% of the time to form curium-248 while the remaining 3.1% of decays are spontaneous fission. One microgram (µg) of californium-252 emits 2.3 million neutrons per second, an average of 3.7 neutrons per spontaneous fission. Most of the other isotopes of californium decay to isotopes of curium (atomic number 96) via alpha decay. Californium was first synthesized at the University of California Radiation Laboratory in Berkeley, by the physics researchers Stanley G. Thompson, Kenneth Street, Jr., Albert Ghiorso, and Glenn T. Seaborg on or about February 9, 1950. It was the sixth transuranium element to be discovered; the team announced its discovery on March 17, 1950. Only about 5,000 atoms of californium were produced in this experiment, and these atoms had a half-life of 44 minutes. The discoverers named the new element after the university and the state. This was a break from the convention used for elements 95 to 97, which drew inspiration from how the elements directly above them in the periodic table were named. [e] However, the element directly above element 98 in the periodic table, dysprosium, has a name that simply means "hard to get at" so the researchers decided to set aside the informal naming convention. They added that "the best we can do is to point out [that] ... searchers a century ago found it difficult to get to California." Weighable quantities of californium were first produced by the irradiation of plutonium targets at the Materials Testing Reactor at the National Reactor Testing Station in eastern Idaho; and these findings were reported in 1954. The high spontaneous fission rate of californium-252 was observed in these samples. The first experiment with californium in concentrated form occurred in 1958. The isotopes californium-249 to californium-252 were isolated that same year from a sample of plutonium-239 that had been irradiated with neutrons in a nuclear reactor for five years. Two years later, in 1960, Burris Cunningham and James Wallman of the Lawrence Radiation Laboratory of the University of California created the first californium compounds—californium trichloride, californium oxychloride, and californium oxide—by treating californium with steam and hydrochloric acid. The High Flux Isotope Reactor (HFIR) at the Oak Ridge National Laboratory (ORNL) in Oak Ridge, Tennessee, started producing small batches of californium in the 1960s. By 1995, the HFIR nominally produced 500 milligrams (0.018 oz) of californium annually. Plutonium supplied by the United Kingdom to the United States under the 1958 US-UK Mutual Defence Agreement was used for californium production. Traces of californium can be found near facilities that use the element in mineral prospecting and in medical treatments. The element is fairly insoluble in water, but it adheres well to ordinary soil; and concentrations of it in the soil can be 500 times higher than in the water surrounding the soil particles. Fallout from atmospheric nuclear testing prior to 1980 contributed a small amount of californium to the environment. Californium isotopes with mass numbers 249, 252, 253, and 254 have been observed in the radioactive dust collected from the air after a nuclear explosion. Californium is not a major radionuclide at United States Department of Energy legacy sites since it was not produced in large quantities. Californium was once believed to be produced in supernovas, as their decay matches the 60-day half-life of 254Cf. However, subsequent studies failed to demonstrate any californium spectra, and supernova light curves are now thought to follow the decay of nickel-56. The transuranic elements from americium to fermium, including californium, occurred naturally in the natural nuclear fission reactor at Oklo, but no longer do so. Bombardment of californium-250 with neutrons produces californium-251 and californium-252. Prolonged irradiation of americium, curium, and plutonium with neutrons produces milligram amounts of californium-252 and microgram amounts of californium-249. As of 2006, curium isotopes 244 to 248 are irradiated by neutrons in special reactors to produce primarily californium-252 with lesser amounts of isotopes 249 to 255. Microgram quantities of californium-252 are available for commercial use through the U.S. Nuclear Regulatory Commission. Only two sites produce californium-252: the Oak Ridge National Laboratory in the United States, and the Research Institute of Atomic Reactors in Dimitrovgrad, Russia. As of 2003, the two sites produce 0.25 grams and 0.025 grams of californium-252 per year, respectively. Three californium isotopes with significant half-lives are produced, requiring a total of 15 neutron captures by uranium-238 without nuclear fission or alpha decay occurring during the process. Californium-253 is at the end of a production chain that starts with uranium-238, includes several isotopes of plutonium, americium, curium, berkelium, and the californium isotopes 249 to 253 (see diagram). Fifty-ton shipping cask built at Oak Ridge National Laboratory which can transport up to 1 gram of 252Cf. Large and heavily shielded transport containers are needed to prevent the release of highly radioactive material in case of normal and hypothetical accidents. Californium-252 has a number of specialized applications as a strong neutron emitter, and each microgram of fresh californium produces 139 million neutrons per minute. This property makes californium useful as a neutron startup source for some nuclear reactors and as a portable (non-reactor based) neutron source for neutron activation analysis to detect trace amounts of elements in samples. [h] Neutrons from californium are employed as a treatment of certain cervical and brain cancers where other radiation therapy is ineffective. It has been used in educational applications since 1969 when the Georgia Institute of Technology received a loan of 119 µg of californium-252 from the Savannah River Plant. It is also used with online elemental coal analyzers and bulk material analyzers in the coal and cement industries. Neutron penetration into materials makes californium useful in detection instruments such as fuel rod scanners; neutron radiography of aircraft and weapons components to detect corrosion, bad welds, cracks and trapped moisture; and in portable metal detectors. Neutron moisture gauges use californium-252 to find water and petroleum layers in oil wells, as a portable neutron source for gold and silver prospecting for on-the-spot analysis, and to detect ground water movement. The major uses of californium-252 in 1982 were, in order of use, reactor start-up (48.3%), fuel rod scanning (25.3%), and activation analysis (19.4%). By 1994 most californium-252 was used in neutron radiography (77.4%), with fuel rod scanning (12.1%) and reactor start-up (6.9%) as important but distant secondary uses. In October 2006, researchers announced that three atoms of oganesson (element 118) had been identified at the Joint Institute for Nuclear Research in Dubna, Russia, as the product of bombardment of californium-249 with calcium-48, making it the heaviest element ever synthesized. 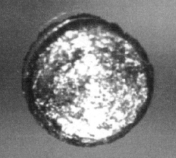 The target for this experiment contained about 10 mg of californium-249 deposited on a titanium foil of 32 cm2 area. Californium has also been used to produce other transuranium elements; for example, element 103 (later named lawrencium) was first synthesized in 1961 by bombarding californium with boron nuclei. Californium that bioaccumulates in skeletal tissue releases radiation that disrupts the body's ability to form red blood cells. The element plays no natural biological role in any organism due to its intense radioactivity and low concentration in the environment. Californium can enter the body from ingesting contaminated food or drinks or by breathing air with suspended particles of the element. Once in the body, only 0.05% of the californium will reach the bloodstream. About 65% of that californium will be deposited in the skeleton, 25% in the liver, and the rest in other organs, or excreted, mainly in urine. Half of the californium deposited in the skeleton and liver are gone in 50 and 20 years, respectively. Californium in the skeleton adheres to bone surfaces before slowly migrating throughout the bone. The element is most dangerous if taken into the body. In addition, californium-249 and californium-251 can cause tissue damage externally, through gamma ray emission. Ionizing radiation emitted by californium on bone and in the liver can cause cancer. ^ The Earth formed 4.5 billion years ago, and the extent of natural neutron emission within it that could produce californium from more stable elements is extremely limited. ^ A double hexagonal close-packed (dhcp) unit cell consists of two hexagonal close-packed structures that share a common hexagonal plane, giving dhcp an ABACABAC sequence. ^ The three lower-mass transplutonium elements—americium, curium, and berkelium—require much less pressure to delocalize their 5f electrons. ^ Other +3 oxidation states include the sulfide and metallocene. Compounds in the +4 oxidation state are strong oxidizing agents and those in the +2 state are strong reducing agents. ^ Europium, in the sixth period directly above element 95, was named for the continent it was discovered on, so element 95 was named americium. Element 96 was named curium for Marie Curie and Pierre Curie as an analog to the naming of gadolinium, which was named for the scientist and engineer Johan Gadolin. Terbium was named for the village it was discovered in, so element 97 was named berkelium. ^ The Nuclear Regulatory Commission replaced the Atomic Energy Commission when the Energy Reorganization Act of 1974 was implemented. The price of californium-252 was increased by the NRC several times and was $60 per microgram by 1999; this price does not include the cost of encapsulation and transportation. ^ In 1975, another paper stated that the californium metal prepared the year before was the hexagonal compound Cf2O2S and face-centered cubic compound CfS. The 1974 work was confirmed in 1976 and work on californium metal continued. ^ By 1990, californium-252 had replaced plutonium-beryllium neutron sources due to its smaller size and lower heat and gas generation. ^ An article entitled "Facts and Fallacies of World War III" in the July 1961 edition of Popular Science magazine read "A californium atomic bomb need be no bigger than a pistol bullet. You could build a hand-held six-shooter to fire bullets that would explode on contact with the force of 10 tons of TNT." ^ a b CRC 2006, p. 1.14. ^ a b c d CRC 2006, p. 4.56. ^ Joseph Jacob Katz; Glenn Theodore Seaborg; Lester R. Morss (1986). The Chemistry of the actinide elements. Chapman and Hall. p. 1038. ISBN 9780412273704. Retrieved July 11, 2011. ^ a b Greenwood & Earnshaw 1997, p. 1265. ^ a b c d e f NNDC contributors (2008). Sonzogni, Alejandro A. (Database Manager) (ed.). "Chart of Nuclides". National Nuclear Data Center, Brookhaven National Laboratory. Retrieved March 1, 2010. ^ a b c d Jakubke 1994, p. 166. ^ Haire 2006, pp. 1522–1523. ^ a b Haire 2006, p. 1526. ^ Haire 2006, p. 1525. ^ Szwacki 2010, p. 80. ^ a b c d e f O'Neil 2006, p. 276. ^ a b c Haire 2006, p. 1522. ^ Cotton et al. 1999, p. 1163. ^ a b Seaborg 2004. ^ a b c d CRC 2006, p. 4.8. ^ Polinski, Matthew J.; Iii, Edward B. Garner; Maurice, Rémi; Planas, Nora; Stritzinger, Jared T.; Parker, T. Gannon; Cross, Justin N.; Green, Thomas D.; Alekseev, Evgeny V. (May 1, 2014). "Unusual structure, bonding and properties in a californium borate". Nature Chemistry. 6 (5): 387–392. Bibcode:2014NatCh...6..387P. CiteSeerX 10.1.1.646.749. doi:10.1038/nchem.1896. ISSN 1755-4330. ^ Haire 2006, p. 1504. ^ Hicks, D. A.; Ise, John; Pyle, Robert V. (1955). "Multiplicity of Neutrons from the Spontaneous Fission of Californium-252". Physical Review. 97 (2): 564–565. Bibcode:1955PhRv...97..564H. doi:10.1103/PhysRev.97.564. ^ Hicks, D. A.; Ise, John; Pyle, Robert V. (1955). "Spontaneous-Fission Neutrons of Californium-252 and Curium-244". Physical Review. 98 (5): 1521–1523. Bibcode:1955PhRv...98.1521H. doi:10.1103/PhysRev.98.1521. ^ Hjalmar, E.; Slätis, H.; Thompson, S.G. (1955). "Energy Spectrum of Neutrons from Spontaneous Fission of Californium-252". Physical Review. 100 (5): 1542–1543. Bibcode:1955PhRv..100.1542H. doi:10.1103/PhysRev.100.1542. ^ a b c d Martin, R. C.; Knauer, J. B.; Balo, P. A. (1999). "Production, Distribution, and Applications of Californium-252 Neutron Sources". Applied Radiation and Isotopes. 53 (4–5): 785–92. doi:10.1016/S0969-8043(00)00214-1. PMID 11003521. ^ a b c d Cunningham 1968, p. 103. ^ Thompson, S. G.; Street, Jr., K.; A., Ghiorso; Seaborg, Glenn T. (1950). "Element 98". Physical Review. 78 (3): 298. Bibcode:1950PhRv...78..298T. doi:10.1103/PhysRev.78.298.2. ^ Thompson, S. G.; Street, Jr., K.; Ghiorso, A.; Seaborg, Glenn T. (1950). "The New Element Californium (Atomic Number 98)" (PDF). Physical Review. 80 (5): 790. Bibcode:1950PhRv...80..790T. doi:10.1103/PhysRev.80.790. ^ Street, K., Jr.; Thompson, S. G.; Seaborg, Glenn T. (1950). "Chemical Properties of Californium" (PDF). Journal of the American Chemical Society. 72 (10): 4832. doi:10.1021/ja01166a528. ^ Seaborg 1996, p. 82. ^ Weeks & Leichester 1968, p. 849. ^ a b Weeks & Leichester 1968, p. 848. ^ Heiserman 1992, p. 347. ^ Diamond, H; Magnusson, L.; Mech, J.; Stevens, C.; Friedman, A.; Studier, M.; Fields, P.; Huizenga, J. (1954). "Identification of Californium Isotopes 249, 250, 251, and 252 from Pile-Irradiated Plutonium". Physical Review. 94 (4): 1083. Bibcode:1954PhRv...94.1083D. doi:10.1103/PhysRev.94.1083. ^ "Element 98 Prepared". Science News Letter. 78 (26). December 1960. ^ "The High Flux Isotope Reactor". Oak Ridge National Laboratory. Archived from the original on May 27, 2010. Retrieved August 22, 2010. ^ Osborne-Lee 1995, p. 11. ^ "Plutonium and Aldermaston – an Historical Account" (PDF). UK Ministry of Defence. September 4, 2001. p. 30. Archived from the original (PDF) on December 13, 2006. Retrieved March 15, 2007. ^ Osborne-Lee 1995, p. 6. ^ a b Haire 2006, p. 1519. ^ Haire, R. G.; Baybarz, R. D. (1974). "Crystal Structure and Melting Point of Californium Metal". Journal of Inorganic and Nuclear Chemistry. 36 (6): 1295. doi:10.1016/0022-1902(74)80067-9. ^ Zachariasen, W. (1975). "On Californium Metal". Journal of Inorganic and Nuclear Chemistry. 37 (6): 1441–1442. doi:10.1016/0022-1902(75)80787-1. ^ a b Emsley 2001, p. 90. ^ a b c d e ANL contributors (August 2005). "Human Health Fact Sheet: Californium" (PDF). Argonne National Laboratory. Archived from the original (PDF) on July 21, 2011. ^ Fields, P. R.; Studier, M.; Diamond, H.; Mech, J.; Inghram, M.; Pyle, G.; Stevens, C.; Fried, S.; et al. (1956). "Transplutonium Elements in Thermonuclear Test Debris". Physical Review. 102 (1): 180–182. Bibcode:1956PhRv..102..180F. doi:10.1103/PhysRev.102.180. ^ Baade, W.; Burbidge, G. R.; Hoyle, F.; Burbidge, E. M.; Christy, R. F.; Fowler, W. A. (August 1956). "Supernovae and Californium 254" (PDF). Publications of the Astronomical Society of the Pacific. 68 (403): 296–300. Bibcode:1956PASP...68..296B. doi:10.1086/126941. Retrieved September 26, 2012. ^ Conway, J. G.; Hulet, E.K. ; Morrow, R.J. (February 1, 1962). "Emission Spectrum of Californium". Journal of the Optical Society of America. 52. doi:10.1364/josa.52.000222. Retrieved September 26, 2012. ^ a b Krebs 2006, pp. 327–328. ^ a b Heiserman 1992, p. 348. ^ Cunningham 1968, p. 105. ^ Haire 2006, p. 1503. ^ a b NRC 2008, p. 33. ^ Seaborg 1994, p. 245. ^ Shuler, James (2008). "DOE Certified Radioactive Materials Transportation Packagings" (PDF). United States Department of Energy. p. 1. ^ Martin, R. C. (September 24, 2000). Applications and Availability of Californium-252 Neutron Sources for Waste Characterization (PDF). Spectrum 2000 International Conference on Nuclear and Hazardous Waste Management. Chattanooga, Tennessee. Archived from the original (PDF) on June 1, 2010. Retrieved May 2, 2010. ^ Seaborg 1990, p. 318. ^ Osborne-Lee 1995, p. 33. ^ Osborne-Lee 1995, pp. 26–27. ^ "Will You be 'Mine'? Physics Key to Detection". Pacific Northwest National Laboratory. October 25, 2000. Archived from the original on February 18, 2007. Retrieved March 21, 2007. ^ Davis, S. N.; Thompson, Glenn M.; Bentley, Harold W.; Stiles, Gary (2006). "Ground-Water Tracers – A Short Review". Ground Water. 18 (1): 14–23. doi:10.1111/j.1745-6584.1980.tb03366.x. ^ a b Osborne-Lee 1995, p. 12. ^ "Evaluation of nuclear criticality safety data and limits for actinides in transport" (PDF). Institut de Radioprotection et de Sûreté Nucléaire. p. 16. Archived from the original (PDF) on May 19, 2011. Retrieved December 20, 2010. ^ Mann, Martin (July 1961). "Facts and Fallacies of World War III". Popular Science. 179 (1): 92–95, 178–181. ISSN 0161-7370. "force of 10 tons of TNT" on page 180. ^ Oganessian, Yu. Ts. ; Utyonkov, V.; Lobanov, Yu. ; Abdullin, F.; Polyakov, A.; Sagaidak, R.; Shirokovsky, I.; Tsyganov, Yu. ; et al. (2006). "Synthesis of the isotopes of elements 118 and 116 in the californium-249 and 245Cm+48Ca fusion reactions". Physical Review C. 74 (4): 044602–044611. Bibcode:2006PhRvC..74d4602O. doi:10.1103/PhysRevC.74.044602. ^ Sanderson, K. (October 17, 2006). "Heaviest element made – again". Nature News. Nature. doi:10.1038/news061016-4. ^ Schewe, P.; Stein, B. (October 17, 2006). "Elements 116 and 118 Are Discovered". Physics News Update. American Institute of Physics. Archived from the original on October 26, 2006. Retrieved October 19, 2006. ^ <Please add first missing authors to populate metadata.> (April 1961). "Element 103 Synthesized". Science News-Letter. 79 (17): 259. doi:10.2307/3943043. ^ Cunningham 1968, p. 106. Cotton, F. Albert; Wilkinson, Geoffrey; Murillo, Carlos A.; Bochmann, Manfred (1999). Advanced Inorganic Chemistry (6th ed.). John Wiley & Sons. ISBN 978-0-471-19957-1. CRC contributors (1991). Walker, Perrin; Tarn, William H. (eds.). Handbook of Metal Etchants. CRC Press. ISBN 978-0-8493-3623-2. CRC contributors (2006). Lide, David R. (ed.). Handbook of Chemistry and Physics (87th ed.). CRC Press, Taylor & Francis Group. ISBN 978-0-8493-0487-3. Cunningham, B. B. (1968). "Californium". In Hampel, Clifford A. (ed.). The Encyclopedia of the Chemical Elements. Reinhold Book Corporation. LCCN 68029938. Greenwood, N. N.; Earnshaw, A. (1997). Chemistry of the Elements (2nd ed.). Butterworth-Heinemann. ISBN 978-0-7506-3365-9. Haire, Richard G. (2006). "Californium". In Morss, Lester R.; Edelstein, Norman M.; Fuger, Jean (eds.). The Chemistry of the Actinide and Transactinide Elements (3rd ed.). Springer Science+Business Media. ISBN 978-1-4020-3555-5. Seaborg, Glenn T. (1996). Adloff, J. P. (ed.). One Hundred Years after the Discovery of Radioactivity. Oldenbourg Wissenschaftsverlag. ISBN 978-3-486-64252-0. Seaborg, Glenn T. (2004). "Californium". In Geller, Elizabeth (ed.). Concise Encyclopedia of Chemistry. McGraw-Hill. p. 94. ISBN 978-0-07-143953-4. Weeks, Mary Elvira; Leichester, Henry M. (1968). "21: Modern Alchemy". Discovery of the Elements. Journal of Chemical Education. pp. 848–850. ISBN 978-0-7661-3872-8. LCCN 68015217. Wikimedia Commons has media related to Californium. Look up californium in Wiktionary, the free dictionary.